I forgot my blogging space for a while. he...he...Don't ask me where did I go? Disappearing from this space is not new for me and you can expect similar kind of disappearance in future owing to my tight work schedule. I am pressing myself and managed to post something today to really wake my blog up. A simple, handy and quick chutney helped me out in this situation. 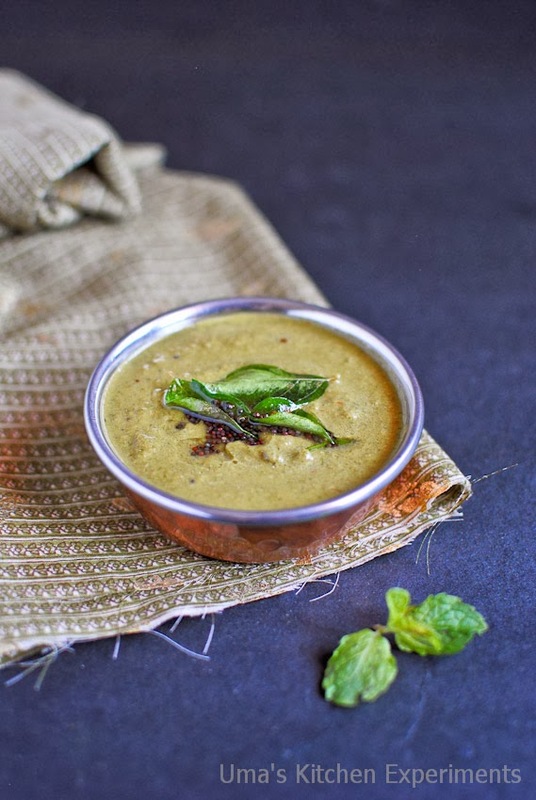 Mint Chutney and its flavor would be loved by everyone and my family is not an exception. My hubby and I love it and he buys a bunch whenever we see it in the market. There are many ways to use this mint leaves as a condiment or chutney for idly and dosa and here is the simplest one to go with. I'll try to share all the versions I know if time permits. 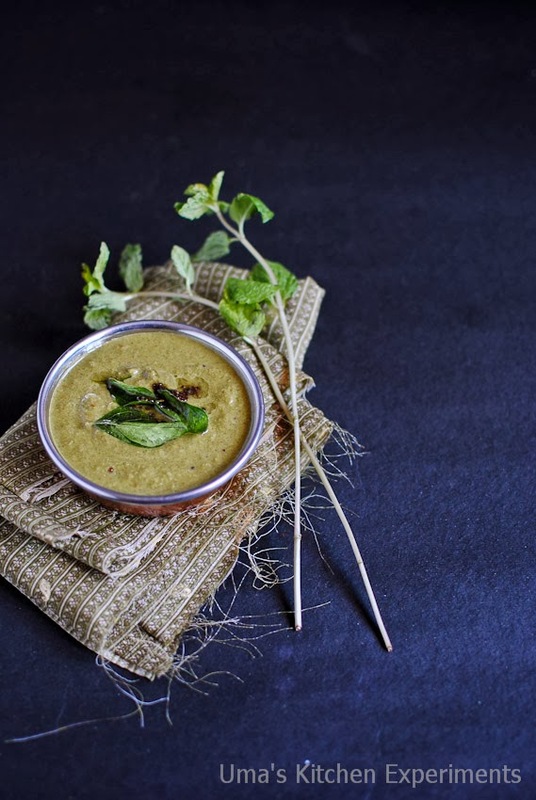 It is a basic mint chutney and you can use curry leaves or coriander leaves in place of mint leaves. You can bring in other variations too and enjoy. Dry red chilli - 1 no. Green Chillies - 2 -3 nos. 1) Wash the mint leaves well and drain the water completely. Soak tamarind in two tablespoon of water. 2) Take a pan and add a teaspoon of oil. 3) When it is hot, add urad dal and dry red chilli. Fry well till it becomes nice brown colour and releases very nice aroma. Once done, transfer to a plate. 4) To the same pan, add washed mint leaves and saute till it shrinks well and releases very nice aroma. Try to saute it without changing color. Once done, transfer to a plate and cool it. 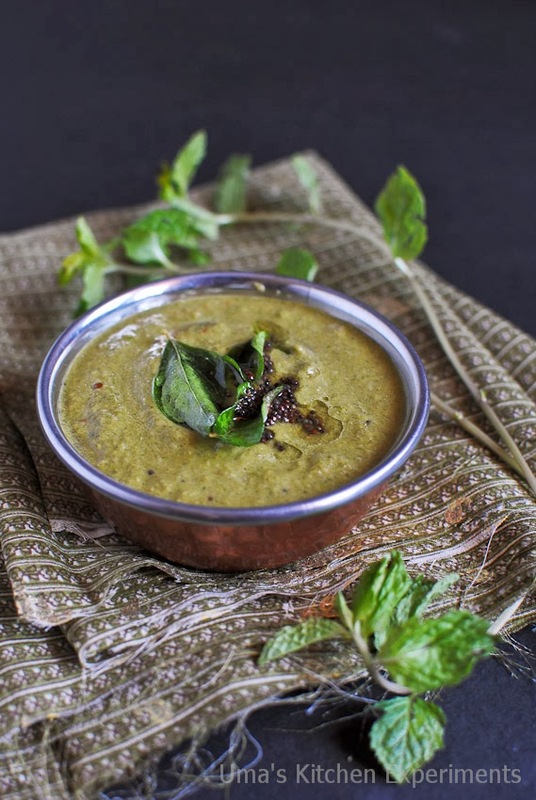 5) Grind mint leaves and urad dal along with other ingredients mentioned under "For Chutney". 6) Add enough water and salt to grind. Taste and adjust salt. 7) Transfer to a bowl. 8) Take a seasoning pan or to the same pan what we used above, heat 2 teaspoons of oil. 9) Add the ingredients given under the section "For Seasoning" and allow it to splutter. 10) Pour the seasoning to the chutney bowl and mix well. Serve with idly or dosa. 1) Adjust the red chilli and green chillies count based on your spicy level. 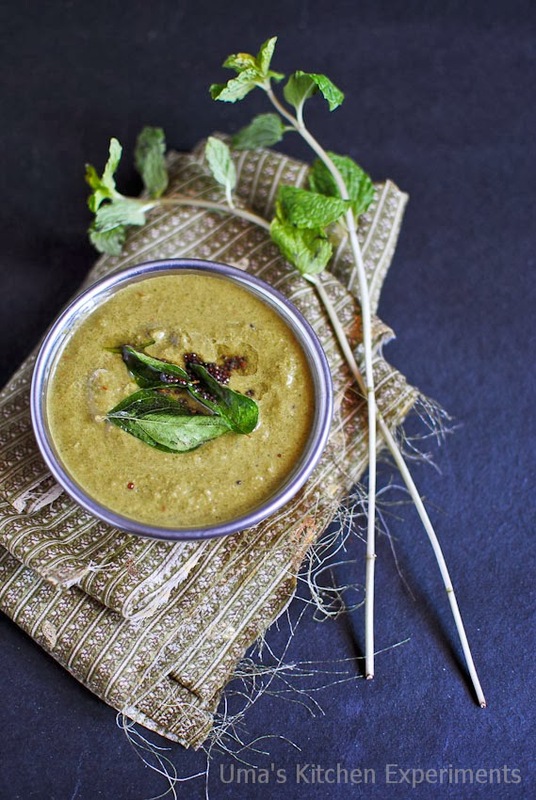 2) For nice green colour of this chutney, add only green chillies and add more mint leaves. 3) Tastes good when it is served fresh. If there is any leftover, refrigerate it. Nice and flavorful chutney,make it often as we both like this chutney..fabulous clicks as always.. I love mint coconut chutney. My recipe is different. Love your version. very very flavorful and delicious chutney :) looks so inviting !! Immigration Overseas Pvt Ltd is an Immigration Law firm that provides all type of immigration services with just a click. We have an experience of 22 years in the immigration industry with 99.2 percent of success rate. We had provided our immigration services to thousands of people across the globe.